Nestled among the Aravalis, Sariska is the closest place from Delhi where one can hope to see a Tiger in it's natural surroundings. Once the hunting grounds of the Maharajas, Sariska was made into a forest reserve in 1955 and declared a National park in 1982. 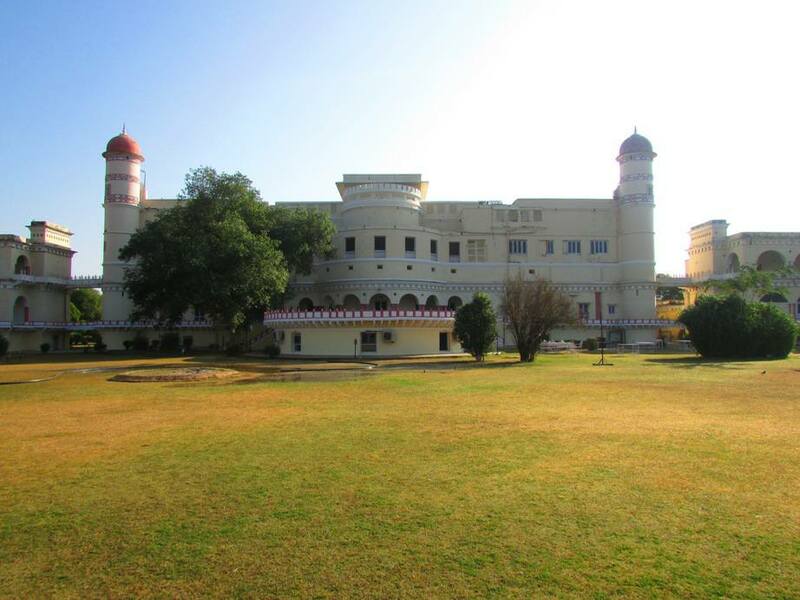 Sariska Palace was built in the 19th century. The forest is dotted with old forts and temples. Built in the 19th century by Maharaja Jai Singh of Alwar this imposing palace served as a hunting lodge for the Maharajas for the years to come. This palace was built to welcome the Duke of Connaught, Son of Queen Victoria. The palace was highly appreciated for its structure and location. The royal guests had the privilege of viewing the wild cats like tigers and leopards from the balconies of the palace. It is also believed that they even hunted standing right on their balconies. At the lobby, one can easily see tiger mannequins preserved till date. It’s a Heritage Hotel with all the Modern Amenities like Swimming pool, Lawn tennis, Table tennis, Huge lawns to play Cricket, Football etc and Relax. 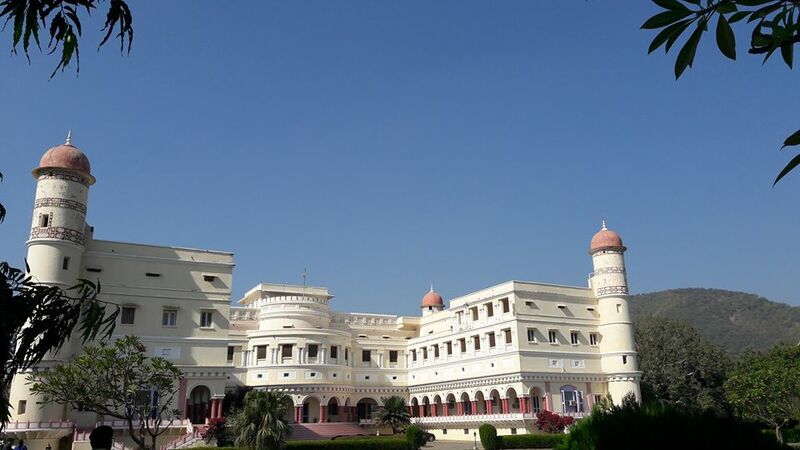 Based in a total of 100 acres it's facade and lush green lawns even in the middle of Rajasthan are a treat to watch. With Royal architecture in a picturesque surrounding, this Palace is ideal for Fairy Tale / Destination Weddings. It has 6 huge lawns and creates magic. They can house around 300 guests on double occupancy and host a gathering for 1000 people. Recently redone rooms of the Queens and the suites in the main wing along with rooms in the Lords corner are quiet good and . The huge area and proximity to the jungle along with 2 conference halls make it an ideal place for family stay, group stay for conferences and for wild life enthusiasts. The Palace is visited by many tourists around the world throughout the whole year. With typical high ceilings and spacious rooms and suites, the hotel offers a pleasant and memorable stay. If you are lucky enough, you might also get to have a look at the wildlife below while relaxing on the hotel terrace. 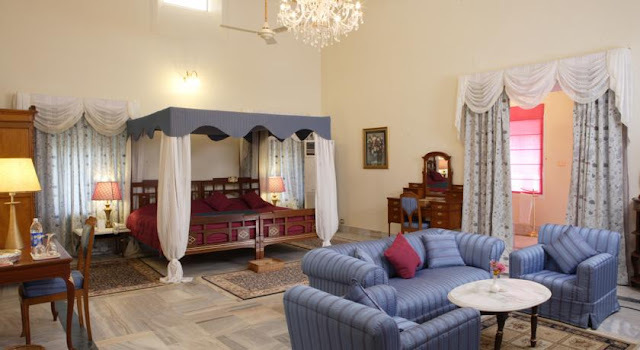 With a total of 75 well-furnished rooms, the palace provides all the modern amenities and facilities. With attached bathrooms and hot and cold water facilities, your stay at the Palace would be pleasant and enjoyable one at anytime of the year. Each room has been tastefully done with original Regency Victorian furniture and provides a good view of the wildlife outside. 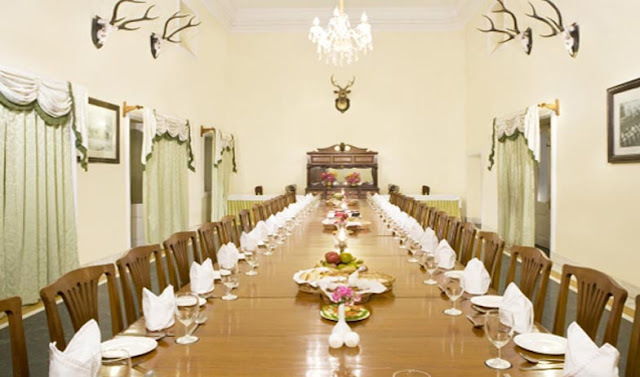 While one can have a panoramic view of the hills from 1st floor which has a huge balcony of the hotel, one can also catch up a glance of the herds of deer and the wild boars rutting through the undergrowth from this hotel. Colorful water birds flying through the sky also produce a memorable spectacle. Rooms are huge, spacious and comfortable. Air conditioner and fans work well. Beds are clean and big enough. 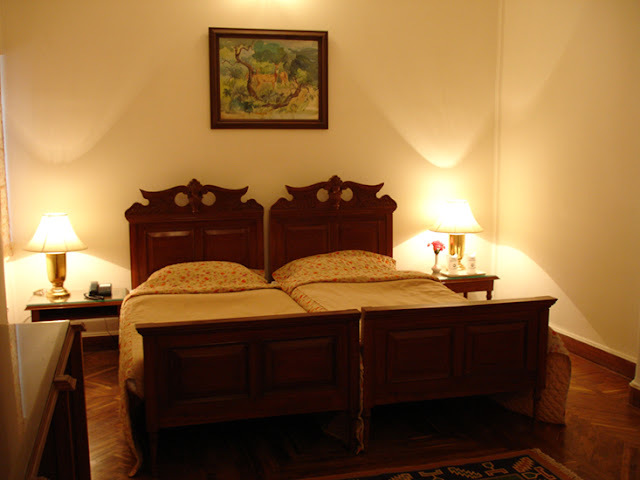 With tea and coffee making facilities, bedside lamps etc. Everything is very old and used including the furniture. You don’t know if the walls are grey, yellow or were white many years ago. Bathrooms are in white marble. Water mixers are in gold, covered with patina. The facilities are yellow now, but originally were white. The restaurant serves Continental, Chinese and Indian cuisines, whereas Indian and imported spirits are served at the bar of this hotel. Food is good and they normally have some Rajasthani Folk music during the evening. The Sariska Tiger Reserve is home to a number of carnivores including Leopard, Wild Dog, Jungle Cat, Hyena, Jackal, and Tiger. 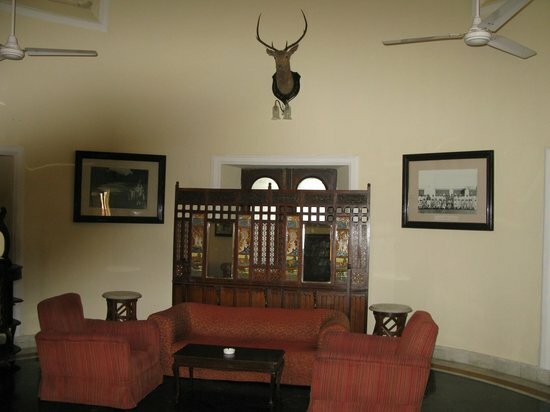 The herbivore category in Sariska includes Sambhar, Chitel, Nilgai, Wild Boar and Langur. Sariska wildlife sanctuary is also known for its large population of Rhesus Monkeys. There are also many bird species in Tiger Reserve, namely- Peafowl, Bush Quail, Sand Grouse, Tree Pie, Golden Backed Wood Pecker, Crested Serpent Eagle and the Great Indian Horned Owl. The Kankwari Fort - Major historic structure within the Sariska National Park includes the Kankwari Fort where Emperor Aurangzeb once imprisoned his brother. The Ancient Shiva Temple - Neelkanth Temple within the Sariska Tiger Sanctuary dates back to the 6th -13th century AD, is a must visit. 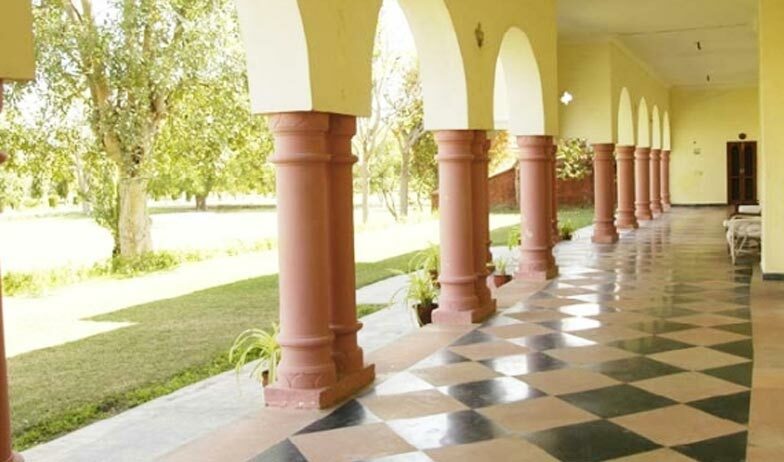 Best suited weather: Sariska is cool in winter and hot in summer. Nights are much cooler than the day. Best Season: October to February. Sightings though are higher in May-June if you could bear the heat. Cards accepted: All major credit cards. Distance: 115 km from Jaipur Airport, 36 km from Alwar Railway Station, 200 km from Delhi. Train: The nearest rail head is at Alwar.